Above: Sen. Suzanne Geist enjoys the warm waters of Bonaire, an island in the Caribbean Sea off the coast of Venezuela. Life has a way of interfering with the best laid plans of even the most meticulous of strategists. Lincoln Sen. Suzanne Geist learned this lesson early. The Arkansas native was two weeks away from earning her undergraduate degree in broadcast journalism from the University of Nebraska-Lincoln and eager to take on the world when she was summoned for grand jury duty — jury duty that lasted a year and a half. Once released from jury duty, Geist found her original career plans detoured. So, with the encouragement of her husband Mark, she decided to forge a different path. She was a stay-at-home mom for a time to three now-grown children—Alexis, John and Derek—and held a variety of sales positions, including telecommuncations and pharmaceuticals. Most recently, she is self-employed as a style consultant and representative for a fashion line. Being a “people person” helps in sales, Geist said, and on the campaign trail, where she and Mark spent countless hours knocking on doors and listening to voters. While a great way to connect with constituents, the one-on-one campaign style left little time for bicycling, one of Geist’s favorite hobbies. She said the couple, who’ve been married for 32 years, would routinely ride several hours per week before campaign duties called. “One thing people learn about me pretty quickly is that I don’t like to sit still,” she said. 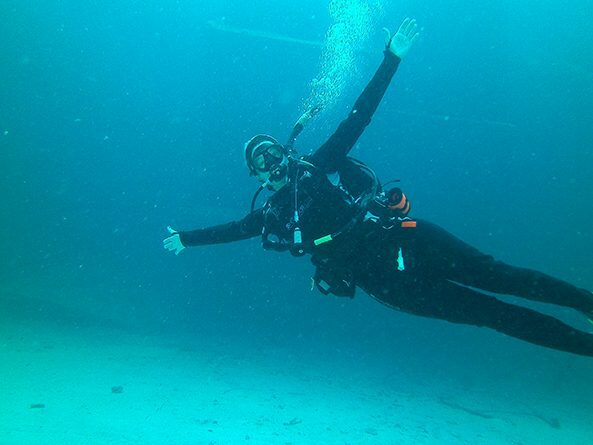 Another warm weather favorite of the new senator is scuba diving. “I would happily travel anywhere warm to scuba dive,” Geist said, adding that she and her husband planned trips to Bonaire and Cozumel after the primary and general elections, with another on tap after the conclusion of her first session as a state senator. Those who know her won’t be surprised that Geist is drawn to a quiet hobby. Despite her years in sales, Geist describes herself as a strategic thinker who wants to be knowledgeable and fully prepared before entering any discussion. Her role model in that regard is former state senator and current U.S. Senator Deb Fischer. Geist said her approach to the Legislature will mirror her approach to life in general: listen and learn. Although not involved in politics prior to her run for a seat in the Unicameral, Geist said she often found herself in leadership positions in any group that she joined. As it turned out, that someone was Geist. After years of being an avid political observer, she expressed frustration regarding state politics to friends, and was encouraged to run for office. Upon reflection, Geist decided that since her children were grown it was a good time for her to become more involved in policy decisions that impact families like hers. Her five young grandchildren—all of whom live in Lincoln—will provide a much needed reprieve from public life and add balance to the new senator’s busy schedule.